The Monochrom is an awkward beast to handle and essentially it offers little in the way of flexibility. However, the images it produces are extremely good, and even the noise is attractive, but the tonal characteristics are dark and moody. Despite the advent and ubiquity of colour film, it's quite likely that a number of Leica cameras have been used exclusively for black and white pictures. Beyond the Ilford single use camera owner, Leica users are probably more apt to shoot in black and white. I point this out neither to mock or praise, but as a simple, if general, observation – so it makes sense that if a company is going to make a camera that shoots only in monochrome, it should be Leica. Leica's M-Monochrom attracted a great deal of attention when it was first announced in 2012, partly for the fact that it shoots only in mono, and partly for its stunning £6,000+ price tag. The real attraction though should be the camera's sensor. Using all of its pixels for collecting luminosity information, and without the hindrance of having to decipher and interpolate colour values, this naked array should enjoy an ability to resolve pure and crisp detail beyond the usual expectations of an 18-million-pixel sensor. The feature-set of this camera might be summed up in the sentence 'it takes pictures', as in truth it does little else. In an attempt to produce a pared down and simple device, Leica has steered clear of including anything other than the basics of what you might need. Leica photographers should be grateful for any degree of automation and can't take even aperture priority for granted – though the Monochrom does allow this daring luxury. A camera isn't necessarily worse off for a lack of features, since offering centre-weighted metering (as the Monochrom does) but no autofocus and no picture styles, doesn't make the camera less useable. Where we might begin to struggle with such abstinence though is when real photography functions are affected – such as with a restricted ISO range of 320-10,000. Although such a range is obviously a good thing for those who like to shoot in low light, those who enjoy an f/2 lens for its f/2 maximum aperture – and who prefer to shoot during the hours of daylight – might find their options rather limited. Leica does provide a 'pull process' ISO 160 setting, but we know without looking that this will have a reduced dynamic range, and inevitably, blown highlights. The most obvious feature of the camera is of course the remarkable sensor. It's an 18Mp device that measures 23.9x35.8mm – full frame. As it's required to output luminance values, it has no use for the RGB coloured Bayer filters that usually feed colour information to pixels. That means it can collect more light than most – hence the minimum ISO 320 setting. Neither is there any use for a low-pass filter, meaning the resolution of the light passing from the lens isn't reduced and there's no need for the usual interpolation. Consequently, this sensor arrangement should possess a first-class ability to render detail clearly without the need for post-capture Unsharp Masking. As the sensor is full-frame, lenses retain the effects of their marked focal lengths. The Leica M lens series offers focal lengths of between 16mm and 135mm, but this camera is designed to provide screen guides for 28mm, 35mm, 50mm, 75mm, 90mm and 135mm lenses. With Leica's usual digital camera viewfinder magnification of 0.68x, the 47.1mm mechanical base length of the rangefinder focusing system is effectively 69.25mm – which is slightly shorter than the company's film models. Focusing should still be very accurate. The feature most missing on the Leica Monochrom though is a good rear screen. The 2.5in 230k-dot model provided lacks the resolution and the size to be as useful as one might hope a screen would be on a camera of this type (and price!). 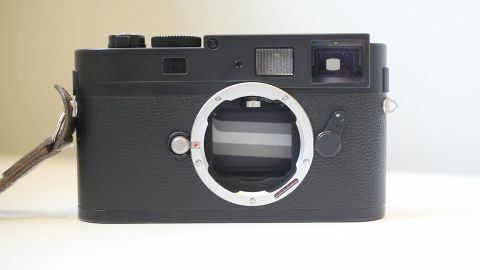 Rangefinder base length: this term simply refers to the distance between the two windows in a rangefinder focusing system that create the double overlaid image in the viewfinder of Leica M cameras, and others. The distance is significant as, in general terms, the further apart the windows are the more accurate the focusing system. All of Leica's current M film and digital models have a base length of 69.25mm, but the greater magnification of the film camera viewfinders (0.72x) makes their rangefinders more accurate in practice than that of the Monochrom, which has a viewfinder magnification of 0.62x.